Pacho's blag: Tonight we roast... me! 8 of 30 speeches finished. I finished up Specialty Speeches #3 The Roast picking on myself. It was good fun by all. 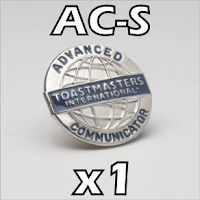 That wrapped up my Advanced Communicator Silver so I think I'm going to get through a set of ed sessions before going back to finish my remaining advanced speeches to complete AC-G.
Getting there. This has been a great year on many levels. Hard work but nice to see it pay off.